Egg salad is easy to prepare and makes great sandwiches on sliced bread, slider buns, or small rolls or biscuits. Add sliced tomatoes and some lettuce to the sandwich for a delicious lunch. Egg salad can also be served on lettuce or spinach leaves. Add tomato wedges and slices of ripe avocado or serve the salad with soup or a tossed salad. Put the eggs in a saucepan and cover with cold water. Place the pan over high heat on the stove and bring the water to a boil. Remove the pan from the heat, place a lid on the pan, and let the eggs stand for about 15 minutes. Remove the lid and run cold water over the eggs until they are cool enough to handle. While the eggs are still slightly warm, peel them. Tap the ends on the countertop to crack and then roll them gently to crack all over. Start peeling at the wide end. Put the eggs in a medium-sized bowl and chop well. Blend the chopped eggs with the chopped celery and green onion, if using. Add 2 tablespoons of mayonnaise and blend well. Add more mayonnaise, as needed to moisten and to suit your preferences. Stir in salt and freshly ground black pepper to taste. For easier peeling, use eggs that are about one week old. Very fresh eggs can be difficult to peel. If you have a pressure cooker, make the eggs in that—the eggshells simply slip off after they've been cooked with high-pressure steam. Hard-boiled eggs are easiest to peel as soon as they're cool enough to handle. Roll the egg on the countertop to loosen the shell and start peeling at the wider end. Hard-boiled eggs in the shell can be kept refrigerated for up to one week. Peeled hard-boiled eggs are best used the same day as they are made. The best way to "chop" up the eggs is to wash your hands well and then use them to mash up the eggs. You can also smash them with a whisk or a pastry cutter. Serve the egg salad on small split biscuits. These cream cheese and chive biscuits would be perfect for egg salad biscuit sandwiches. Replace the green onion with 1 to 2 tablespoons of finely chopped sweet onion, yellow onion, or red onion. Replace the chopped onion and celery with about 2 tablespoons of chopped ripe olives and 1 to 2 tablespoons of chopped and drained oil-packed sun-dried tomatoes. Experiment with your favorite add-ins, such as chopped cucumber or finely chopped dill pickles, as well as seasonings like paprika, garlic powder, onion powder, or dill. 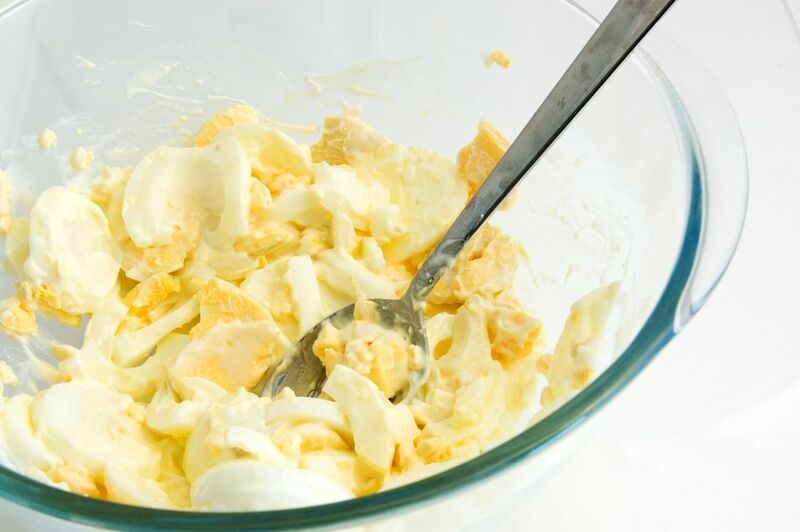 For a lighter egg salad with an extra dose of protein, replace half of the mayo with nonfat Greek yogurt. Cherries and Chicken Salad: the Perfect Sandwich Filling!